Seren Bundy-Davies had a relatively late introduction to athletics when starting training with her current coach, Stephen Ball, at the age of 17 after finishing fourth at the English Schools. The Trafford athlete has wasted little time though in setting out her stall, improving her 400m PB to a UK lead of 51.72 when winning the Sainsbury’s Indoor Grand Prix in Birmingham in February. Having missed out on Commonwealth Games selection last year by running the qualifying time a month too late, the talented athlete represented Great Britain in the 4x400m relay at the European Team Championships in Braunschweig and made her GB individual debut at the European Indoor Championships in Prague, where she claimed a bronze medal. 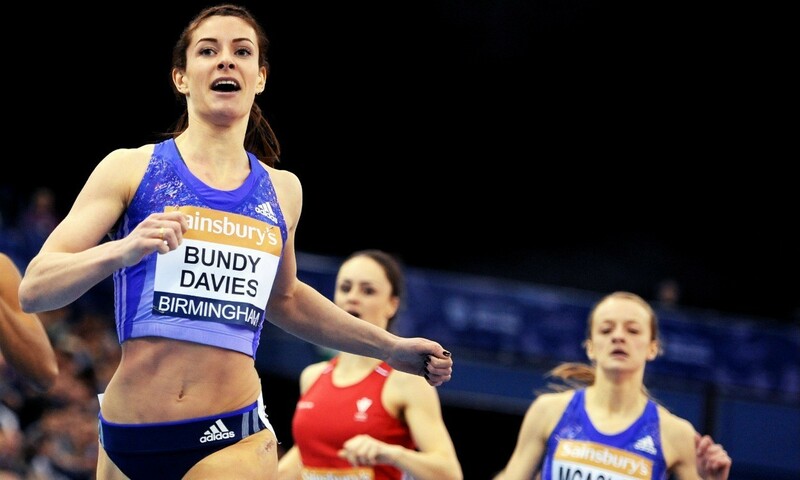 Having failed to finish at the UK Indoor Championships as a result of being tripped while in the lead, Bundy-Davies showed her competitive spirit by bouncing back six days later in Birmingham with a scintillating victory and lifetime best. Bundy-Davies trains at the track at Stretford on Tuesdays and Thursdays and also on a Sunday from the spring onwards, depending on how training has progressed. On Wednesdays she trains indoors at Sport City in Manchester, while on Mondays and Fridays she uses the Sugden Gym in the centre of the city. This is all fitted around studying for a biomedical science degree at Manchester University. Monday: Strength and conditioning with Nick Jones (usually a heavier weights session). Weights are a relatively new part of my programme as I only started weight training in September 2014. The programme changes fairly regularly, but exercises could include: eccentric squat, Romanian deadlifts, squat clean, push press, dumbbell bridge press. Wednesday: (am) Shorter speed session such as: 2 sets of 3x60m off a walk-back recovery and approximately 8min between sets. (pm) Core session – I improvise with this aspect as it’s often at the end of a weights session, but sometimes I include circuits such as: 30sec mountain climbers, 30sec plank, 30sec ‘bicycle crunch’ – repeated until failure! Thursday: (pm) Specific lactic/speed endurance session. For example: 3x350m off 6min recovery (depends on time of year, but 47sec average). Friday: (pm) Strength and conditioning but with lighter/faster weights. More medicine ball and bodyweight exercises also. Saturday: Usually a rest day. Closer to races we could do a specific 400m session/split 400m session to see where I’m at and then Sunday becomes a rest day. Before the Glasgow international match in January I ran a 300m/100m off 1 minute. Sunday: Short hill sprint session. The hills increase in distance but the longest isn’t over 60sec. A typical session might include reps of 16sec and then it goes to 32, 45, 50sec approximately. (Sunday sessions are very different according to what time of year it is. We have three main venues which are completely different from one another. One of our toughest is at Alderley Edge).